(sorry about the size of that one--click to make it bigger). I know he had the 1.51 ERA is 2012. But his strikeouts are at to 2 k/inning (18 k/9) on the season, his walks are stable, and he's allowed just one home run on the year. He's been ridiculous***. ***This calls for a graph dump! 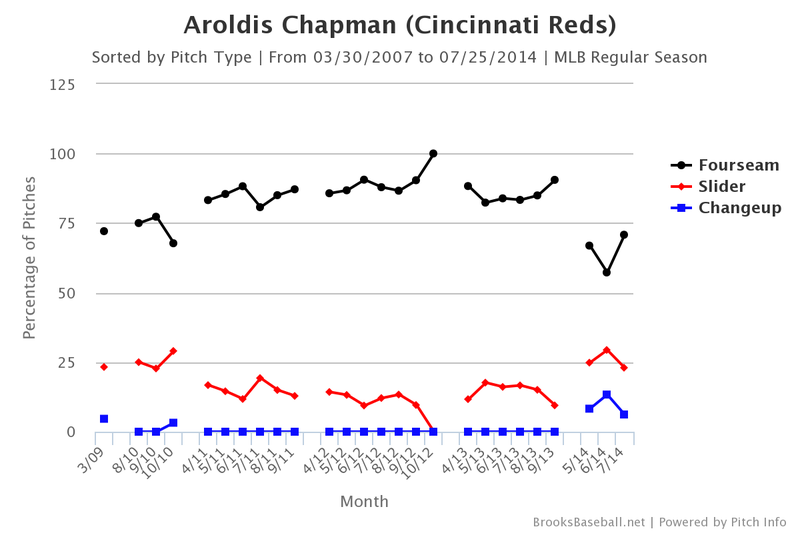 Aroldis has had months in which he has averaged over 100 mph. But he's never had three consecutive months like this before in terms of sheer power. It's pretty straightforward. 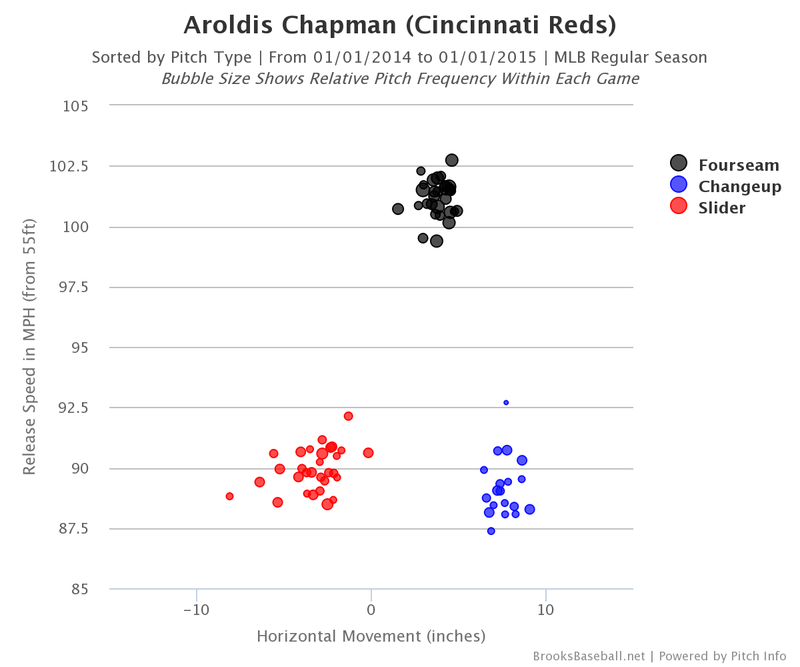 Chapman throws crazy-hard, with a fastball that breaks back away from a right-handed hitter while traveling at roughly the speed of sound. And on top of that, he has a change-up that breaks almost 10 inches away from a righty, and then a slider that breaks in toward the right-handed batter's back foot. 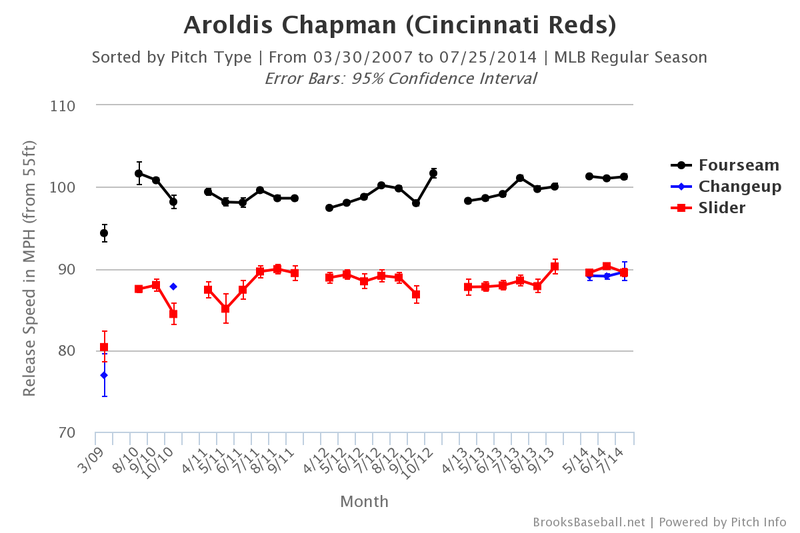 The change-up and slider break opposite directions and travel roughly the same velocity. After living almost exclusively with this fastball at times from 2011-2013, he's dropped his usage of that pitch into the high 60% range. 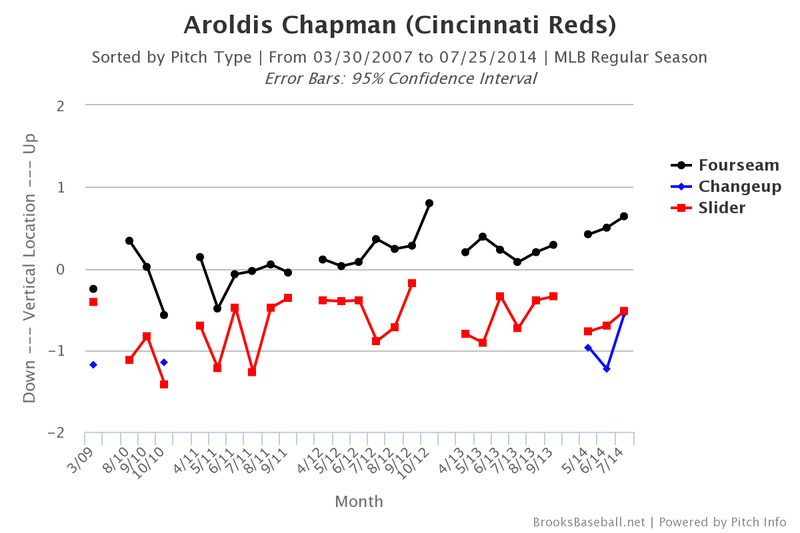 Instead, he's now throwing a quarter of his pitches as sliders, and is working in change-ups at a consistent, low rate. One last thing: on a recent Redleg Nation Radio, Bill Lack asked whether Aroldis gets beat more often when pitching down in the zone than when pitching up in the zone. 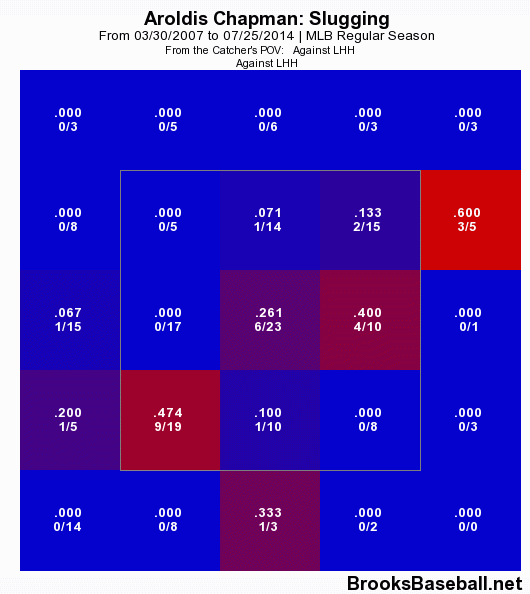 Here is are opposing batters' slugging percentages against Chapman in different parts of the zone. (also known as "good luck, fella"). Lefties have gotten good wood on the ball when throws in the strike zone down and away, but otherwise are basically hopeless against him. Bill's perceptions hold true here. When Chapman is throwing in the bottom half of the zone against righties, he's actually been hit pretty well during his career. When he elevates the ball, however, it's been pretty much lights out. And this isn't the pattern you always see either. 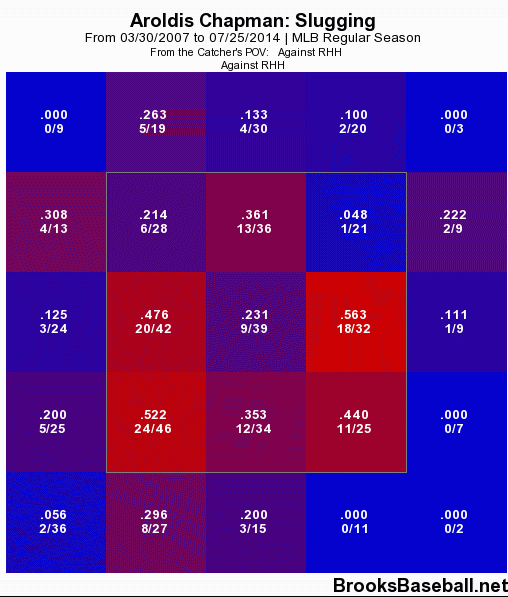 Here's a link to Cueto's graph; he gets it up in the top part of the zone as well. 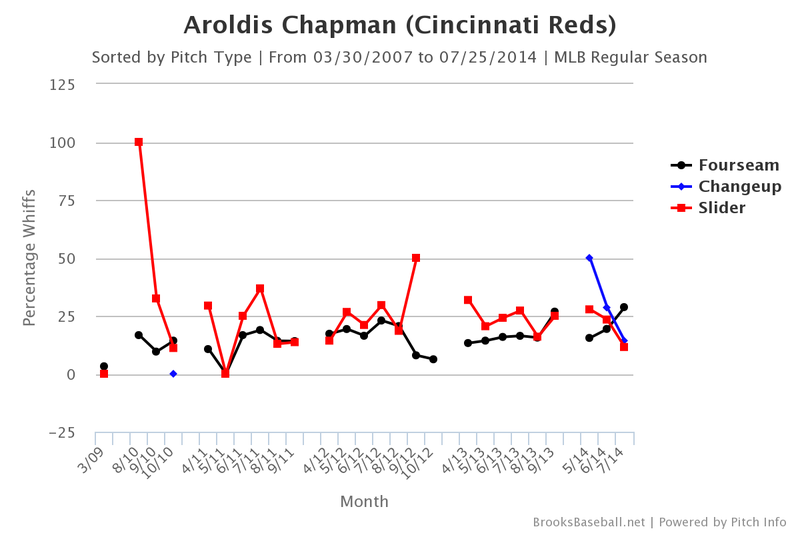 All of Chapman's success this year is made all the more amazing by the fact that he suffered a serious head injury in spring training. He's been one of the bright spots on the team thus far. I don't know if he'll still be on the team by the end of the year, as he would seem to be a nice trade chip if Jocketty decides the Reds need to sell off some parts. I think someone would overpay for him. But it's fun to enjoy him while he's still a member of the Reds. All graphs courtesy of the amazing Brooks Baseball.